Getting Rid of a Mole Control Problem - Yes Pest Pros, Inc. Getting Rid of a Mole Control Problem - Yes Pest Pros, Inc. Most people are familiar with the phrase, “Making a mountain out of a molehill,” but most don’t really know that much about moles. These small mammals, fairly common in Indiana, are typically four to eight inches long and have large front feet with claws designed to dig through your yard. 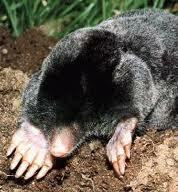 There is no mistaking the signs of moles in your yard. The two ways you can spot a mole issue is a molehill or raised ridged areas that show the path of a mole. Anyone who sees a molehill in their yard will likely question that common idea that a molehill is a small thing, as they will be quickly on the phone to reach an mole exterminator. While you can see these signs above ground, it is underneath the ground that the real issue arises. Moles live by creating tunnels underground, as a way to get from their dens where they sleep to places where they can find food, which usually involves worms and insects. Unbeknownst to you, the lower layers of your lawn could actually be filled with many of these tunnels, providing a highway-like infrastructure for a colony of moles. The issue of moles is one that really needs to be taken care of promptly because, as any mole extermination service will tell you, moles can not only ruin a lawn, but they can also cause the death of plants, flowers and garden crops, as the moles uproot them when tunneling through the yard. They really can be terrible pests, and it is a smart idea to contact an pest control company as soon as you think you have a mole issue. Don’t despair, though, because there are both residential and commercial pest control companies that have the knowledge and experience to rid your property of a mole problem. Mole exterminators know the best methods to ensure that moles will be gone and more moles won’t come to take their place. Some exterminators deal only with insect removal and nothing else so make sure that the company you call works in mole removal. While it is not always an easy task, but an experienced residential and pest control company like Young Environmental Solutions can handle the problem. Call YES Pest Pros today for your mole control problems. YES will rid your property of these destructive, costly, pests in a professional and environmentally responsible manner.